That tsunami is one of the few Japanese words in global use points to the country’s familiarity with natural disaster. 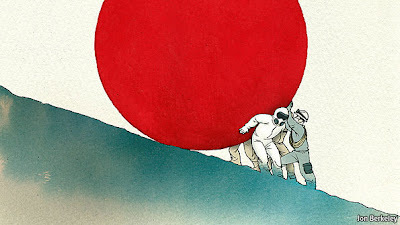 But even measured against Japan’s painful history, its plight today is miserable. The magnitude-9 earthquake—the largest ever in the country’s history, equivalent in power to 30,000 Hiroshimas—was followed by a wave which wiped out whole towns. With news dribbling out from stricken coastal communities, the scale of the horror is still sinking in. The surge of icy water shoved the debris of destroyed towns miles inland, killing most of those too old or too slow to scramble to higher ground (see article). The official death toll of 5,429 will certainly rise. In several towns over half the population has drowned or is missing. In the face of calamity, a decent people has proved extremely resilient: no looting; very little complaining among the tsunami survivors. In Tokyo people queued patiently to meet their tax deadlines. Everywhere there was a calm determination to conjure a little order out of chaos. Volunteers have rushed to help. The country’s Self-Defence Forces, which dithered in response to the Kobe earthquake in 1995, have poured into the stricken area. Naoto Kan, the prime minister, who started the crisis with very low public support, has so far managed to keep a semblance of order in the country, despite a series of calamities that would challenge even the strongest of leaders. The government’s inept handling of the Kobe disaster did much to undermine Japan’s confidence in itself. The immediate tragedy may be Japan’s; but it also throws up longer-term questions that will eventually affect people all the way round the globe. Stockmarkets stumbled on fears about the impact on the world’s third-biggest economy. Japan’s central bank seems to have stilled talk of financial panic with huge injections of liquidity. Early estimates of the total damage are somewhat higher than the $100 billion that Kobe cost, but not enough to wreck a rich country. Disruption to electricity supplies will damage growth, and some Asian supply chains are already facing problems; but new infrastructure spending will offset some of the earthquake’s drag on growth. Those calculations could change dramatically if the nuclear crisis worsens. As The Economist went to press, helicopters were dropping water to douse overheating nuclear fuel stored at the Fukushima Dai-ichi plant, where there have been explosions, fires and releases of radiation greater, it seems, than the Japanese authorities had admitted. The country’s nuclear industry has a long history of cover-ups and incompetence, and—notwithstanding the heroism of individual workers—the handling of the crisis by TEPCO, the nuclear plant’s operator, is sadly in line with its past performance. Even if the nuclear accident is brought under control swiftly, and the release of radiation turns out not to be large enough to damage public health, this accident will have a huge impact on the nuclear industry, both inside and outside Japan. Germany has already put on hold its politically tricky decision to extend the life of its nuclear plants. America’s faltering steps towards new reactors look sure to be set back, not least because new concerns will mean greater costs. China has announced a pause in its ambitious plans for nuclear growth. With 27 reactors under construction, more than twice as many as any other country, China accounts for almost half the world’s current nuclear build-out—and it has plans for 50 more reactors. And in the long term the regime looks unlikely to be much deterred from these plans—and certainly not by its public’s opinion, whatever that might be. China has a huge thirst for energy that it will slake from as many wells as it can, with planned big increases in wind power and in gas as well as the nuclear build-out and ever more coal-fired plants. Thus the great nuclear dilemma. For the best nuclear safety you need not just good planning and good engineering. You need the sort of society that can produce accountability and transparency, one that can build institutions that receive and deserve trust. No nuclear nation has done this as well as one might wish, and Japan’s failings may well become more evident. But democracies are better at building such institutions. At the same time, however, democracy makes it much easier for a substantial and implacable minority to make sure things don’t happen, and that seems likely to be the case with plans for more nuclear power. Thus nuclear power looks much more likely to spread in societies that are unlikely to ground it in the enduring culture of safety that it needs. China’s nearest competitor in the new-build stakes is Russia. Yet democracies would be wrong to turn their back on nuclear power. It still has the advantages of offering reliable power, a degree of energy security, and no carbon dioxide emissions beyond those incurred in building and supplying the plants. In terms of lives lost it has also boasted, to date, a reasonably good record. Chernobyl’s death toll is highly uncertain, but may have reached a few thousand people. China’s coal mines certainly kill 2,000-3,000 workers a year, and coal-smogged air there and elsewhere kills many more. It remains a reasonable idea for most rich countries to keep some nuclear power in their portfolio, not least because by maintaining economic and technological stakes in nuclear they will have more standing to insist on high standards for safety and non-proliferation being applied throughout the world. But in the face of panic, of sinister towers of smoke, of invisible and implacable threats, the reasonable course is not an easy one. No country faces that choice more painfully than Japan, scarred by nuclear energy but also deprived of native alternatives. To abandon nuclear power is to commit the country to massive imports of gas and perhaps coal. To keep it is to face and overcome a national trauma and to accept a small but real risk of another disaster. Japan’s all too frequent experience of calamity suggests that such events are often followed by great change. After the earthquake of 1923, it turned to militarism. After its defeat in the second world war, and the dropping of the atom bombs, it espoused peaceful growth. The Kobe earthquake reinforced Japan’s recent turning in on itself. This new catastrophe seems likely to have a similarly huge impact on the nation’s psyche. It may be that the Japanese people’s impressive response to disaster, and the rest of the world’s awe in the face of their stoicism, restores the self-confidence the country so badly needs. It may be that the failings of its secretive system of governance, exemplified by the shoddy management of its nuclear plants, lead to more demands for political reform. As long as Mr Kan can convince the public that the government’s information on radiation is trustworthy, and that it can ease the cold and hunger of tsunami survivors, his hand may be strengthened to further liberalise Japan. Or it may be that things take a darker turn. The stakes are high. Japan—a despondent country with a dysfunctional political system—badly needs change. It seems just possible that, looking back from a safe distance, Japan’s people will regard this dreadful moment not just as a time of death, grief and mourning, but also as a time of rebirth.